If you are searching for the best method to earn online then you are the right place. Today in this article we will be providing you with the information about best way to earn online. 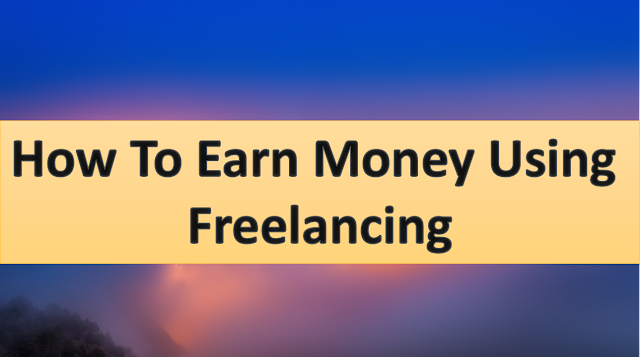 so the best way to earn online is by freelancing. Freelancing is the market place of Idea, skills and talent where anyone can work what they love. These freelancing website has been running about many years and providing services to both employers and freelancer to get work done. You have to just provide the best skill you have in you to the clients and you will be get paid for providing services. Top most freelancing website is Upwork.com. So, lets get started on how to earn money using any freelancing websites. firstly you have to decide what you are good at it may anything ranging from data entry, writer, developer, email handling etc then after deciding the desired skill just sign up to the freelancing website. After signup process you have complete your profile to 100% by providing your previous job experience and educational qualification and other details. Thank you for posting your job opening for Data Entry. I have a good Data Entry experience and i have performed all of the duties listed in your job description that i assures. My Data Entry Skill and good typing speed makes me good fit for data entry position. I can handle Ms Word, Excel , Powerpoint , Pdf. I assure you that i can do data entry fast and accurate without any mistakes. I can be available to work with you at least 30 hours per week as a full time basis. I am Effective problem solver. If the Hiring manager or the client accept your job proposal you can start working on the project and start your earning. It is most difficult to get your first your job but when your get your first job then after you can easily get various job so, just take your time complete your profile and start your earning.